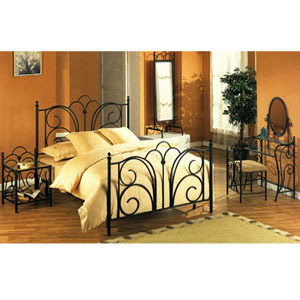 4-Piece Queen Size Bedroom Set In Sand Black Finish. Includes: Queen Size Bed, Night Stand, Vanity Set, And Cheval Mirror. Pieces Are Also Sold Separately. Details: 7541Q (CO) Queen Bed: 60W. X 38H/54H.. 7542 (CO) Night Stand: 21-3/4W. X 20D. X 29H.. 7543 (CO) Vanity Set: Vanity: 30W. X 14D. X 43-3/4H.. Stool: 19-1/2W. X 15-1/2D. X 29H.. 7544 (CO) Cheval Mirror: 23W. X 20D. X 66H.. Easy To Assemble.